While I was not in shape after the East Japan Great Earthquake all through the summer months and into early autumn of the year 2011 many in the West, including Ren Masuda, worked towards the Hisajo Exhibit. The Exhibit was held in the Literary Museum of Kitakyushu city from 3 November to 25 December 2011. Take note that Kitakyushu city, or North Kyushu city, includes the former Kokura city where Hisajo spent all her married life. The museum sits right in Kokura ward of Kitakyushu city. Hisajo’s famed haiku is on pure morning glories against the smoky sky of Kokura, a rising industrial city of the time. Is her unblemished, fair and fresh self subtly projected onto the image of morning glories? Her life in Kokura tended to be cloudy and did not bring about happiness and contentment to her. Even after her death, what was called Hisajo Legend was spread and a severe season continued between the city and Hisajo. But today our city tries to evaluate, honor and is committed to pass down to the future generations, Hisajo’s excellent works. We facilitate our haiku contests and/or events involving child participants to help promote this cause. I hereby express my sincere hope that we can cut open a new history between the two: Hisajo and Kokura. Even though the realization of the Hisajo Exhibit took no less than 60 years after Hisajo’s death and was not in the lifetime of Masako Ishi whose effort and struggle were instrumental to re-evaluate Hisajo, her mother, I am impressed with the director’s words knowing how immovable most Japanese officers of any kind of administration usually are. 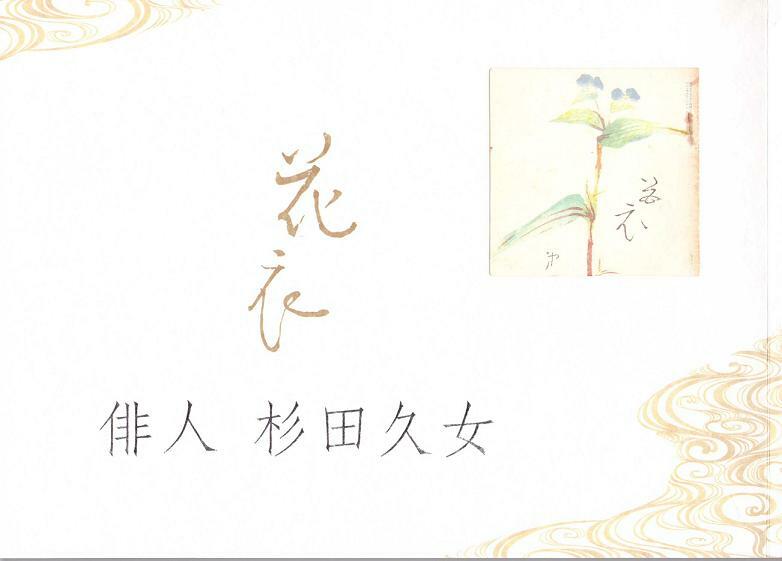 The content of the Exhibit catalogue, following Mr. Director’s official opening message above, consists of six main parts, each subtitled with one haiku of Hisajo. In Chapter 7 of my Hisajo installments, I translated 7 great haiku Hisajo composed on Kagoshima, her birth place. One photograph on page 5 grabbed me. I did not know that the site of her house is now the site of the Greek Orthodox Church of Kagoshima Prefecture. One hundred and twenty two years have passed since Hisajo was born on this site, in a house surrounded by citrus trees and hedges. A high concrete building beside the church indicates the enormous change the area went through over the time. It still tells me she was born into a nice area of a thriving city. I have reread and appreciated those seven haiku even more. The biggest picture on page 5 was taken in Taipei, Taiwan, in 1899: Mother with two daughters and a young woman ( the family employed a maid--ey) Sayo, the mother, looks strong-willed and intelligent. Hisajo’s elder sister, Shizu, who was to marry a high-ranking Navy officer, looks reserved as her name suggests (her Kanji means silence), and looks somewhat distant as if to know her place in the family. Her younger sister closely together with Sayo is Hisajo, and the girl’s rich and black hair resonates with her straight gaze at the camera. Hisajo was 9 years old. Mr. and Mrs. Akabori, Hisajo’s parents, had a traditional virtue of Japanese humbleness and were always kind to everyone including servants and non-Japanese. They were born pre-Meiji, i.e., in the last days of Shogunate, father in mountaneous Nagano Pref, mother in Izushi, the old castle town in Hyogo Pref. Still today the vicinity of Ochanomuzu station in Tokyo has got an air of academic flavor. On page 6 we find a class photo of Ochanomizu Girls High School with tall Hisajo right in the center. The famed school required all the students to wear the medal attached to their tightly woven obi-belt. Hisajo was an apple in her father’s eye and he preserved her A+ history exam with his note in brushstrokes: “descendents should refer” (the photo on page 7). Later in her life, Hisajo arranged to meet, at Ochanomizu Bridge, Yamaguchi Seiton, a Hototogisu haijin who would cross the bridge to walk to Tokyo University where he taught, with the intention to seek for his help in her struggle to obtain Kyoshi’s introduction to her dream ku-shu. Seiton sympathized, but did not help her. Hisajo was educated not only in high school, but also in traditional disciplines: See the dignified flower arrangement license issued from Ikenobo on page 7. Her letter to her father-in-law in Aichi Pref. (page 8) is also very impressive and proves her excellence in calligraphy. The post card in pen from Unai to Miss Hisajo is also very interesting on page 8 placed right by Unai’s self-portrait and Hisajo’s photo taken soon after their marriage. I recognize the same features as those of the 9 year old girl in Taiwan on the young woman, probably at the age of 19, in a fine kimono on page 7, then marvel at subtle changes that Hisajo went through after her marriage with Unai. To me Hisajo in the front by a white azalea on page 11 photo, is a gorgeous bloom herself, looking most confident of all Hisajo photos in the catalogue. This big-family shot was taken in her parents’ home in Mejiro, Tokyo, most likely in 1917 and her brother, Gessen, to whom Kyoshi wrote the letter (which is also exhibited), is standing with his woman behind the white azalea. Hisajo is with her two little girls; the toddler sits watched by her grand-father and aunt Shizu. The grandfather, or Hisajo’s father, died so soon in 1918 and six years later in 1923 this house collapsed in the Great Kanto Earthquake, making Hisajo’s mother leave Tokyo embracing only her happy memories. She chose to live with her eldest son’s family far in Hyogo prefecture, which, in turn, meant that Hisajo lost her “home” in Tokyo because of the Great Earthquake. Hisajo lost her sister, Shizu, in 1926, then in 1929 her brother, Gessen, who introduced haiku to Hisajo, died. Both the eldest brother and Sayo, her affectionate mother, passed away during the War and before Hisajo’s tragic death. The family photograph together with all of them must have been very precious for Hisajo. Hisajo looks strong and pretty in a professional portrait taken with Unai and Masako, their daughter, on page 13. Yet her inner self gradually became torn between the marriage life and her pursuit of haiku. After attending her father’s third memorial rites in 1920, she became ill, and was away from her husband and daughters for one whole year: back and forth between treatment and convalescent periods, in and out of a few hospitals in Tokyo. She finally decided to return to Kokura, and there she was drawn to Christianity. See a group shot on page 17, taken in front of the church, with a foreign lady. Hisajo is the one who sees another direction. The photograph on page 16 taken in 1921 is a superb shot of graceful Hisajo. This must be exactly how Hisajo and her younger daughter Mitsuko looked when Miss Saito, who was later called Teijo, one of 4T, received them at her parents’ home in Kumamoto, Kyushu. As Hisajo’s encounter with Hashimoto Takako, another 4T, occurred in the following year, Takako must have met Hisajo with this gracefulness as well. Soon after their encounter Hisajo began to “commute” to Takako’s mansion to teach haiku. the members on the photo include Yoshioka Zenjido, Yokoyama Hakkoh, Kanzaki Ruru and Dr. and Mrs. Kubo. Hisajo sits at the left end of the first row in 1931 and sits next to Takeshita Shizunojo at the right end of the first row, in 1932. I can sense Hisajo was not necessarily comfortable in this group. Hisajo on page 46 has completely lost her youth, and looks different to me…but we see a proud and poised woman here. She is here as a grand-mother of a new family. Does she look like a person destined to die of hunger 3 years later in a special hospital cell? For that matter please see her portrait on page 53, too. Masako-san, how are you doing? Do you listen to what your father says? If you want something, I will send. Don’t be envious to others’ possessions. Go to your father for any question, ask for his assistance when you are in trouble. Mother is praying for you, wishing you to be a good girl. Don’t tell a lie, don’t cheat. Both your father and our old nanny will take good care of you. So do not worry. Please let me hear from you. Write and let your mom know how you are each day. Be sure to take kind care of your health. And when you can, find time to review your school lessons too. *note: Hisajo had signed Hisa, then drew lines over it and changed it to “mother”. This letter was written mostly in kata-kana for easy reading. Hisajo wrote a few letters to Kanzaki Ruru, (see page 35 and page 41). Kanzaki Ruru (his former family name: Kurata), was the second son of Mr. Kurata, a free-spirited entrepreneur and a traditional land owner in one, and was Unai’s student in Kokura High School. Ruru later founded his own business in Kokura. He was well-versed in literature and Hisajo recognized him as a rising haijin. He belonged to Amanogawa haiku group. His elder brother, by the name Chikara Kurata, was trained as engineer but became President of Hitachi Corporation, whose personal history is included in Nikkei’s auto-biography series. I read and learned that their father once ventured into a railroad installation project in Taiwan. Hisajo must have felt close to him. Hisajo’s letter to Ruru dated on August 16, 1932 was written around the time her decision was being made to terminate Hanagoromo, her haiku magazine. The last issue went to the printer, with her sudden announcement dated 28 August,1932, of the magazine termination on or around this date. This August was the month Hisajo’s hugely admired haiku in Hototogisu magazine was the topic of a feature discussion on Amanogawa magazine. The four members including Ruru evaluated her haiku. There seemed to exist complicated and emotional exchanges between Hisajo and male Amanogawa members and Ruru tried to solve the complication. It is said Ruru’s attempt failed. I have learned a life-long lesson through experiencing the termination of my magazine and I am grateful—I have completely given up the hope to restart my haiku magazine, but I have a desire to get resurrected through something different. Contrary to Hisajo’s positive feeling, her kushu was never published. We can confirm from this letter that what she meant as something different in the previous letter to Ruru was her dream of publishing her kushu, the anthology of her haiku. From these letters I receive the impression that Hisajo was able to be herself when she wrote to him, wildly emotive in the first letter, honest and composed in the second and innocent like a child in the third letter. Always natural and unguarded. Ruru must have meant a lot to Hisajo both as a talented haijin and a great friend; I dare say her soul must have loved him. (Hisajo’s spiritual attachment, however, was not understood as such by Takako, who spread a negative rumor.) Ruru had to die of tuberculosis on February 28, 1936. Ruru’s widowed wife once told that Hisajo walked, climbed and found the kind of flower Ruru wanted to see on his death bed. with whom she attended kukai in Tokyo. Those were the formative days of the woman haiku movement. Kyoshi, in his attempt to spread haiku among women, first invited his own female relatives. Hisajo and Tsurujo seemed to become good friends. In her letter on page 17 Hisajo writes about her daily life filled with housewifely duties and about her rather anxious feelings of living so far in Kokura, disconnected from Tokyo life. In the letter to Fukuda Umeko dated September 7, 1929, shown on page 23, Hisajo gently encourages Umeko to keep submitting her haiku to Amanogawa. Hisajo, a judge for Amanogawa’s women's section, had placed Umeko first. Fukuda Chotei, or Umeko’s son, became a Hototogisu Dojin in the post-war era and contributed this letter to a feature Haiku magazine titled “Hisajo”, issued in 1980, which was one of the counter-efforts against the “Hisajo Legend”. start composing haiku herself when the shrine offered the place to a kukai at Hiko mountain in 1930. Hisajo was an establised haijin acknowleded by respectable citizenship. Hisajo, a member of Tokyo based Hototogisu, was handicapped in terms of distance and wrote many letters to Kyoshi, the editor. They had nice mutual correspondence records to a certain point. See Kyoshi’s letter dated January 9, 1932 on page 34, appreciating Hisajo’s gift of a hand-made pillow filled with hand-picked chrysanthemum petals. According to Kyoshi, she wrote as many as 230 letters during 6 years starting in 1934, to which he did not respond. He did not throw them away either and after her death used some of them for his “novel” he “wrote” for a commercially-based magazine. The letter shown on the right side of page 42 is the one Kyoshi skipped when he wrote “the novel”. The curators judge that the letter must have been written on May 25, 1934, while she was still a Dojin. She sounds desperate here. I wonder why she was so positive in her letter to Ruru only two weeks before. I cried through the night... I will retreat embracing the memory of my 19 years of haiku.~~ I will not be taking another trip to Tokyo and I won’t have a chance to see you~~~ I will be spending the rest of my life like a nun, praying for your health and for the happiness of your daughter. ~~ (I say to myself ) I can not give up haiku. Retirement acutely hurts ... Hisajo respected you as her sun, as her moon on her way of Haiku. Yet I have to retreat from haiku so that I won’t hurt other women. so I won’t threat the position of Teijo, so I won’t replace Mrs. Aoi Honda, so I won’t outshine your daughter. Quietly I put out the lapis lazuli light. on the right side of page 43. A post card drawn by Hisajo for Kyoshi, shown on the same page, is most interesting to me. Her scribble says she drew Mt. Jonen, one peak of Japan Alps from her upstairs room. She writes to Kyoshi: I pray for your good health. It is dated September, 1936, only one month before the elimination. She must have visited Sohoh living on Lake Yamanaka and wrote those haiku on Mt. Fuji in August of the year. She knew full well that Kyoshi wouldn’t write the introduction for her dream kushu, nevertheless she drew such a nice sketch for him... I wonder who kept and offered this post card for this Exhibit. submission, each time with five haiku, was selected for the top page of three issues: July 1932, July 1933 and May 1934. The artifacts regarding her peak are covered from page 32 to page 39. Front and back covers of all issues of Hanagoromo are shown on page 31.
was sincere in her teaching, in her own creative writing, in academic study and in editing. She took a toil so that talent of each contributor would be fairly and effectively presented. I stand on the budding grass and see into myself: My path, as a wife, a mother and also as a haijin, had been thorny. I have to call it a tread of failures, the outcome of the contradiction between my personality and the situation. “She is zero as a woman; repeating Arts, Arts, all the time and not giving any attention to housework. She is queer and heretic!” So often have those words been thrown at my face. Having been oppressed and spat on, I thought of dying several times. A friend I loved, more than once, abandoned me and went away. Yet the fire of life keeps on burning and the earth is forever blessed with new buds. Having tripped over and fallen down, I find myself rising alone again from the bottom of the despair—encouraged to fight and proceed, consoled solely by nature and haiku. I have had neither social position nor wealth. No wonder my fragile talent has been eroded by rains and winds for the past twenty years and here I am about to reach the age of decline. Nevertheless I confirm that I stake happiness in this world and the full length of a woman’s life on Arts. With a hope of tilling again the ground hardened by my recent slump, I humbly start this magazine, something very small, making the use of my gap time between various house chores. (The rest of her address is omitted from the catalogue). Special note: I tried to get permission to include some of the photos from the museum catalogue of Hisajo in this installment, but the museum did not issue the permission. Those of you who live in Japan and are interested in obtaining the catalogue can buy it from them. Contact 093-571-1505. Please note they speak only Japanese.